"5 Yes, I am the vine; you are the branches. Those who remain in me, and I in them, will produce much fruit. For apart from me you can do nothing." Happy (day before) Independence Day! This is the day when the United States celebrates the declaration of Independence. It has become a day of barbecues, picnics and fireworks. Independence...means 'freedom from the control, influence, support, aid, or the like, of others.' Independence is something we all strive to achieve...teenagers can't wait until they are old enough to be 'out of my parent's home.' Many of us desire to be 'independently wealthy.' Senior citizens fight to maintain their own independence! We all want to be in control of ourselves. Our verse in John tells us that we are NOT to be independent of Christ! And to be honest, I don't want to be. I have a hard enough time with living live WITH Jesus as my 'Vine.' I can't imagine being separated from Him. And to be honest, I don't want to even try to do 'life' on my own. So, as our country celebrates her independence from the control of others, let's celebrate our 'dependence' upon our Savior!! 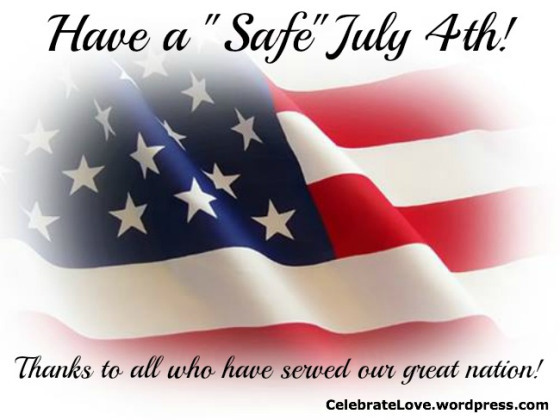 Have a blessed and safe 4th! Praise God for the freedom we have in HIM and for the freedom we have in the USA.